Hamburg, 6 January 2011 � Olympus revolutionised easy-to-use high-performance camera design with the first-ever PEN. Now the E-PL2 takes that revolution to a whole new level. It�s never been easier for beginners to capture photos and movies in professional SLR quality. A larger 3 inch display, Live Guide access in HD Movie mode, the handy Live Wheel feature selector and a faster, lighter, virtually silent M.ZUIKO DIGITAL 14-42mm 1:3-5-5.6 II lens all add to the The latest addition to Olympus� Micro Four Thirds family is a feast for the eyes, a beautiful camera with a fresh, contemporary design. It�s also ideal for the social networking generation � thanks to compatibility with Olympus� new PENPAL Bluetooth� Communication Unit and the ever growing range of dedicated PEN accessories. For ambitious users, the E-PL2 offers every opportunity to explore their creativity. They can experiment with Art Filters in still and HD Movie mode, including the new Dramatic Tone filter, and choose from 16 dedicated Micro Four Thirds lenses, three new conversion lenses (macro, fish-eye and wide), plus 27 Four Thirds and more than 500 other lenses in total (using an adapter). For fans of fuss-free photography, the E-PL2 offers superb image quality and unlimited creative freedom with none of the hassle. The E-PL2 is available from January 2011 for around �500. The lightweight, compact E-PL2 is a landmark in user-friendly and beautiful camera design. With a series of intelligent enhancements, it sets another new benchmark for rival system cameras to live up to and even improves on the legendary usability of the multiple award-winning Olympus PEN E-PL1. Like its predecessor, the E-PL2 comes with the excellent integrated Live Guide that teaches beginners step-by-step how to capture great shots � and this user-friendly feature is now available in HD Movie mode, too. The new Live Wheel on the back makes it easier to navigate menus and pick out the right feature or mode, while the larger 3� LCD with 460,000 dot resolution is ideal for framing and reviewing shots. Another worry-free feature is the new SDXC* card format that provides the flexibility of a �future-proof� medium with huge storage potential � for high-capacity image files like High Definition movies. Like the E-PL1, the E-PL2 is two great things in one � a top-notch stills camera and a compact camcorder for capturing High Definition movies. Ideal for budding filmmakers, the E-PL2 now lets users get creative with one of six Art Filters, even in HD Movie mode � a feature PEN rivals simply can�t match. Among the filters is the new Dramatic Tone Art Filter (taken from Olympus� E-5 D-SLR flagship for professionals) that enhances contrast to create movies and stills with a powerful, otherworldly look. What�s more, the upgraded Art Filter II feature means users can now overlay additional effects (Art Frame, Pin Hole and Soft Focus) on top of existing �filtered� shots. Every PEN camera delivers excellent image quality. To ensure that quality with fast-moving subjects, the E-PL2 comes with the near-silent M.ZUIKO DIGITAL 14-42mm 1:3.5-5.6 II lens (equivalent to 28-84mm for a 35mm camera) that not only focuses faster, but also prevents the whir that can otherwise ruin a good home movie soundtrack. With ISO up to 6400, shutter speed up to 1/4000th second and sequential shooting at 3fps, the E-PL2 is fully equipped to make the best of the superb M.ZUIKO DIGITAL lens system � and deliver excellent images even in poor light. Another advantage for PEN owners is the effective in-body image stabilisation system that corrects camera shake irrespective of the lens or adapter attached. This ensures M.ZUIKO DIGITAL lenses are lighter than the competition, since they don�t require in-built IS of their own. With its 12.3 effective Megapixel High Speed Live MOS sensor, Multi Exposure for combining up to three RAW images and built-in flash, the E-PL2 is packed with trademark PEN technology. This heritage shines through in outstanding photo and HD Movie quality � no matter how unskilled the user. E-PL2 users have more opportunities than ever to add to their camera�s potential. The Accessory Port 2 opens up a new world of creative and networking options thanks to the rapidly expanding range of PEN accessories. For example, the new optional PENPAL Communication Unit, the perfect add-on for the facebook� generation. Compatible with any camera equipped with Accessory Port 2, PENPAL lets users store and send compressed images directly from the camera to a computer or smart phone via Bluetooth� � at the touch of a button. In an instant they can share their best shots with friends, family and colleagues via social networks. Other mouth-watering accessories include the SEMA-1 microphone kit, optical and electronic viewfinders as well as the new MAL-1 Macro Arm Light for precision illumination of macro photos or close-ups of items users want to auction online. Users can also choose from a huge selection of lenses. In addition to the 27 Four Thirds and 500 other lenses available via an adapter, the E-PL2 is compatible with Olympus� prize-winning M.ZUIKO DIGITAL range of specialist Micro Four Thirds lenses. This now extends to the WCON-P01 wide-angle conversion lens for party and landscape shots, the FCON-P01 specialist fisheye converter for creative effects and the MCON-P01 macro converter for extreme close-ups. As a special treat for the creatively inclined, the E-PL2 is compatible with the RM-UC1 cable release that offers the option of locking the release button for bulb exposure. 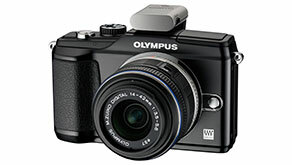 The E-PL2 Olympus PEN will be available for �599 from early January 2011. * SD is a trademark of SD Card Association.